Rode to the top. Ron and Matt arrived later. Waited for Ray, but I the gang as time ran out. 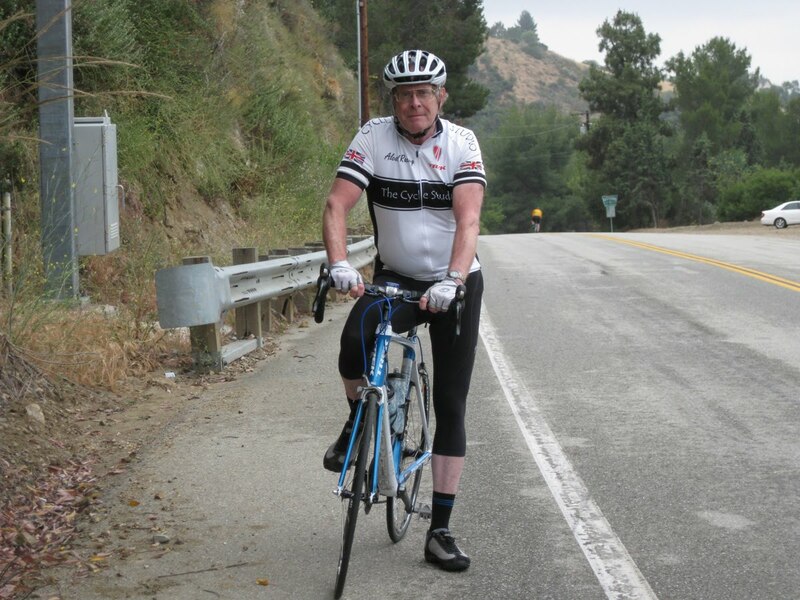 Saw Ken from Saturday riding up. Descending alone, the temperature had cooled off. Coyote Corner did not disappoint. 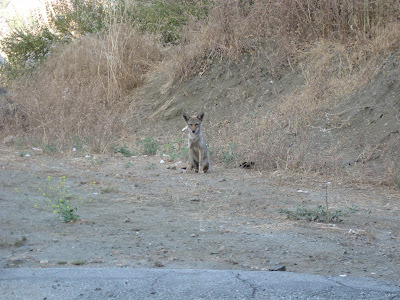 Two pups high tailed it across the road to the safety of their den. One was a bit more bold. Warm afternoon. It was 87F when I started. The shade of the canyon felt good. The winds pushed back those who dared to move. The clouds hung over the valley until 2 pm. The air quality reflected the summer temperatures and coastal clouds into a brown grey glaze over the city. 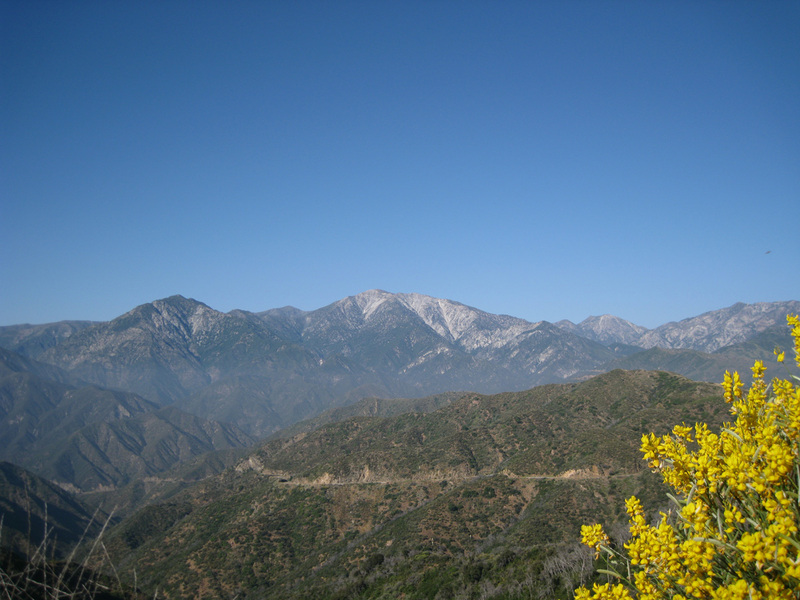 Climbing up over the valley air layer, the view of Baldy looked clear in comparison. The yuccas bloomed in May and June. 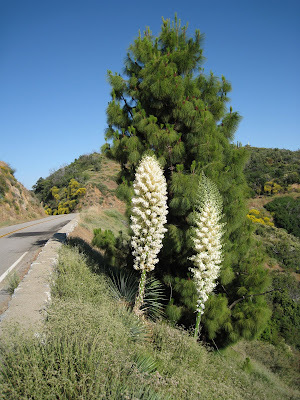 White swords stood proud and tall along the hillside. This pair snuggled next to a pine tree seemed out of place. Desert and pine huddled together. An odd bit along the road told its story. 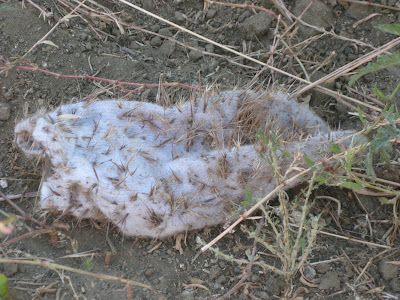 This sock belonged to the driver who careened over the side near mile maker 7.0 last week. Shoes flew off as the car tumbled down the embankment. In the dark of night, the driver crawled out of the 1997 Saturn and scrambled up the hill. 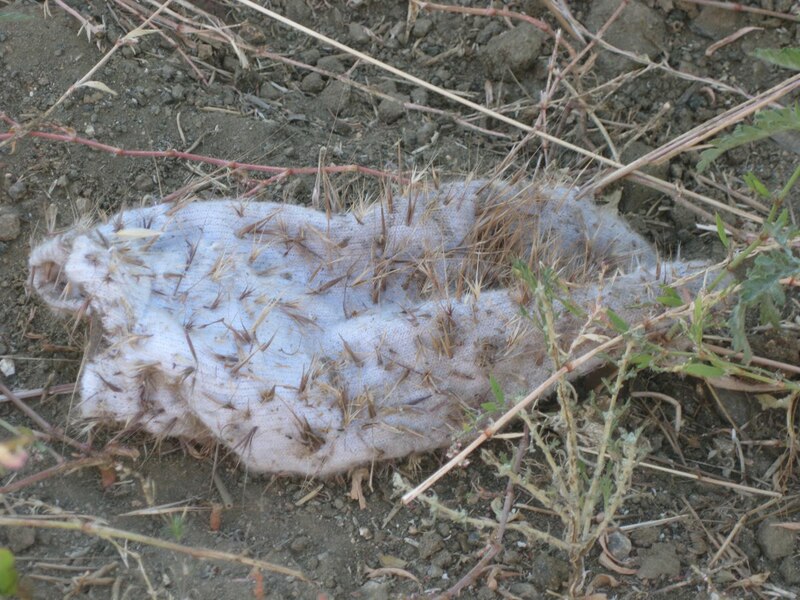 This sock whispered its tale of woe to those who stopped and listened. Did an ok time within my normal range. Reward was a breath of cleaner air. John and I rode with Ken and Brad to the first saddle. Ken a regular on GMR rides about four times a week, so I hope to see you again. 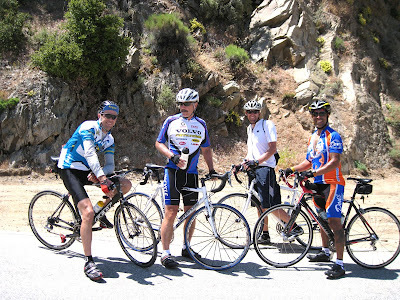 Brad along with 400 other cycling aficionados took SR39 to the Tour of California in May. Important info to know. Met Jim at the shed. I asked if he rode in events. His answer was he rides to eat! Looking good Jim. It must be working. 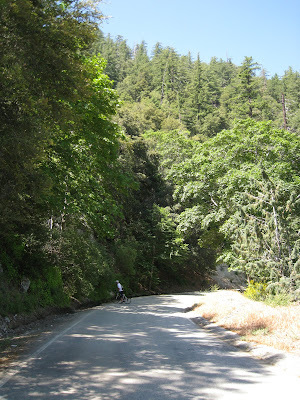 Enjoyed the pine trees of Glendora Ridge Road. Marty of RBC, Matt, John, and Ray of RBC. Good to see you Marty and Ray, its been awhile since our paths crossed. Bill rode to Fork plus Four. It was always good to go a fair distance. Myself, this was trip four to Baldy. Two people the driver 21 years old and his female passenger 19 years old drove off Glendora Mountain Road while traveling "west" before mile marker 7. There is a short uphill section followed by a turn to the left. There is a stone wall where others have missed the turn. Most recently an oil slick from a previous crash has marked the spot and now it has claimed its latest victims driving a 1997 Saturn. The accident occurred at 12:05 am Thursday morning. The car plummeted 350 feet down the slope. The two were air lifted about 1;40 am to the County USC Medical Center. 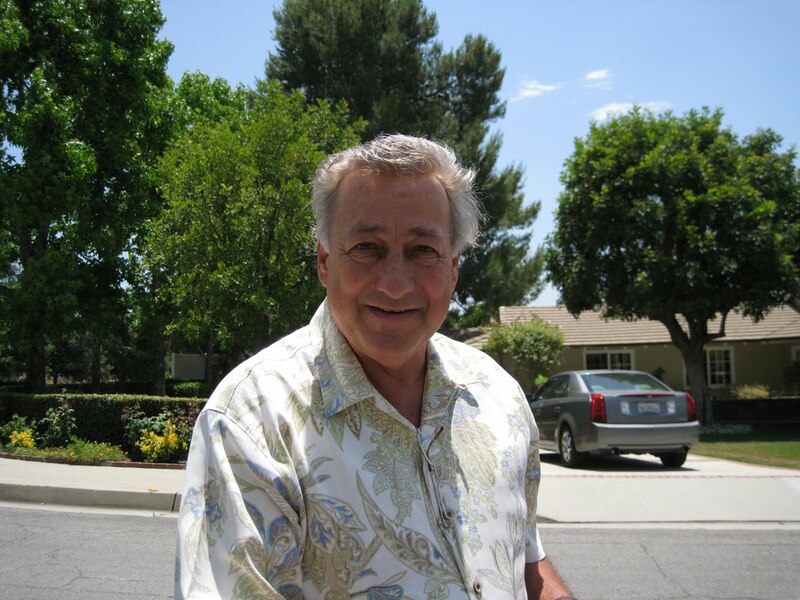 Bob built parts for the Mars Rover at JPL. His work graces two planets. 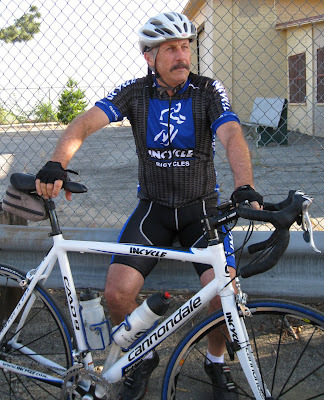 Bob was riding with Manfred. 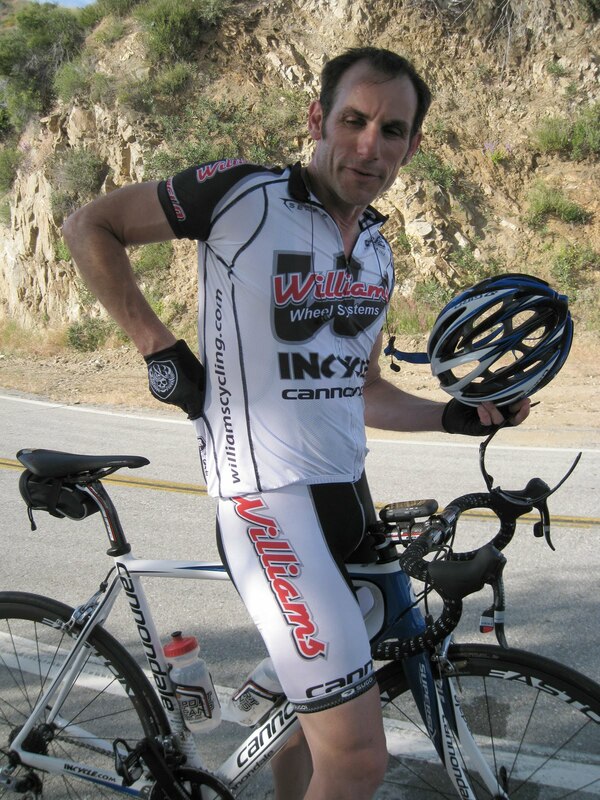 Darren rode by earlier. Warmer than Monday. It was 92F when I started. Coyotes were out and about on the way down. The gaunt male around mile marker 8.69 was bold in comparison to the Monday night coyote at 12.19 who was merely inquisitive. Coyote corner had a pup peaking out the scrub. 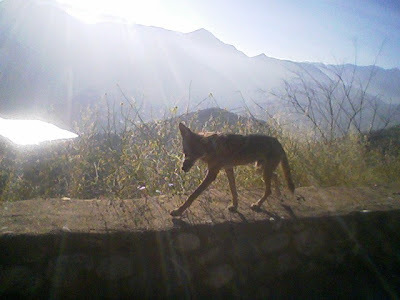 Matt was bolder than the coyote. Good timings for the short and the long haul. Best time for the top of Monroe. Good ride. Good strength. Now for a good night's sleep. Great talking to you Cathy. New Zealand sounded wonderful. The Magormold A-Team. Manfred. Zach. Tony. Matt. Bill rode to the shed. Bill took this picture of an eclectic group of folks at shed. Got Names? Nope. 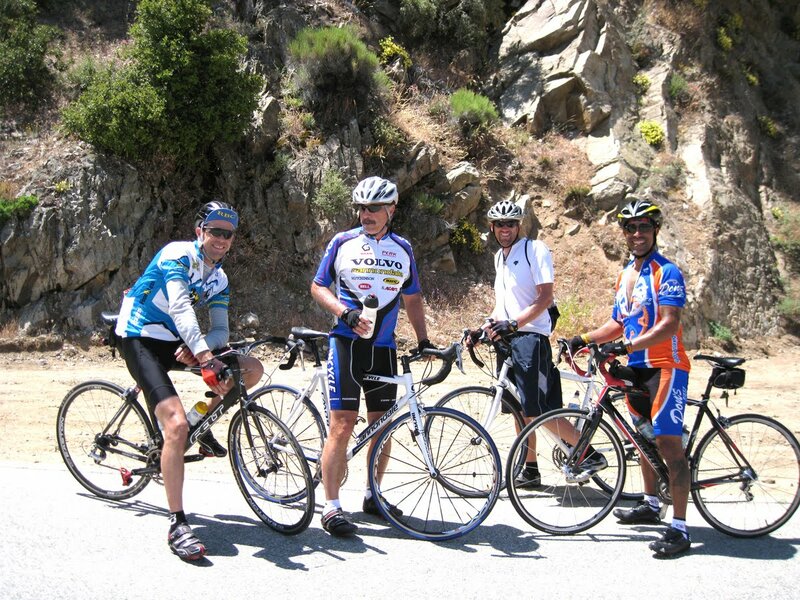 On my ride, a group of riders associated with Stan's Bicycle Store in Monrovia were on the road to Baldy. 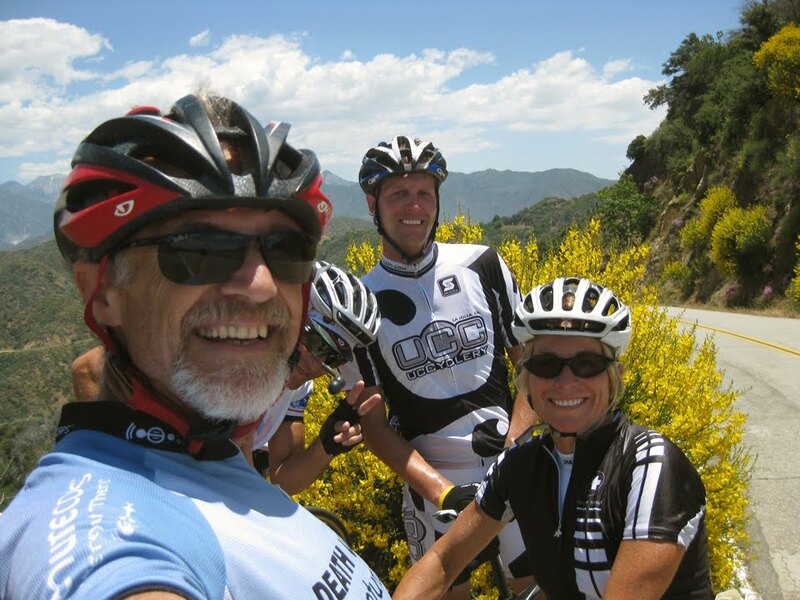 Had a great time playing tag with Gay and Beth from the banana tree to Cow Canyon Saddle. 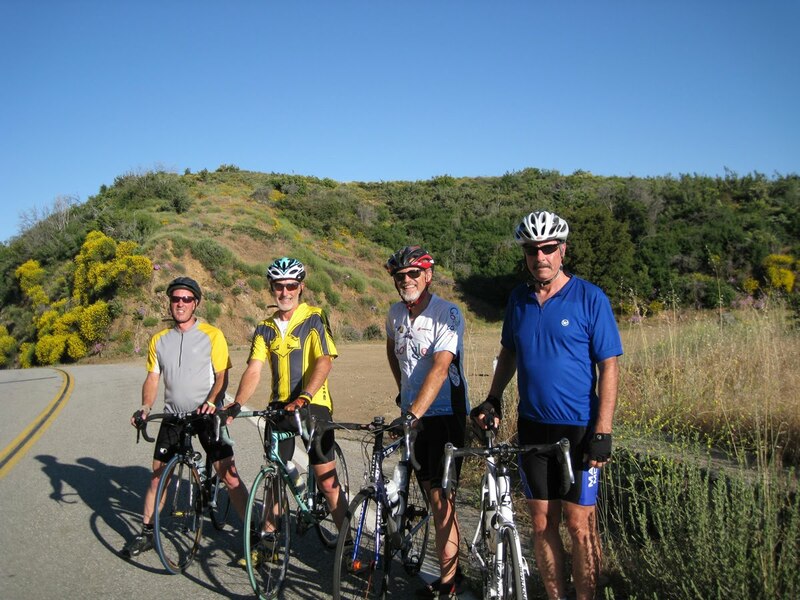 They were training for a Wyoming bike tour in August. I got names but no picture! Good to have someone to chat with. Takes your mind off your legs. In the Village met up with Brian and Ray who were on their way down for their ride. Matt caught up with me in the Village. 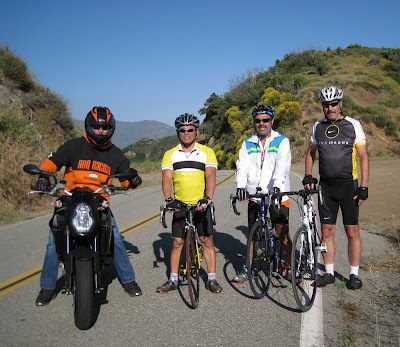 Met Mark who is training for a Hawaii Haleakala Ride. Exotic places. Rode back with Matt. We passed Brian and Ray on their way back. 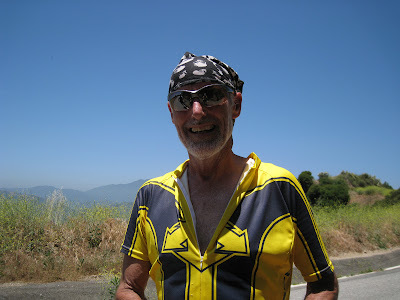 Ray had a flat tire on the reward descent. A one inch slit of the inner seam of the tube. Lucky dog to have the tire hold while he stopped safely. Matt and I discussed about how Ray had his share of incidents. One with a deer many years ago. The bike was totaled. No sooner than those words were spoken, we turned a corner and there she was! We stopped in our tracks. 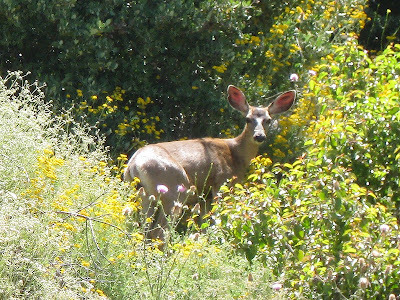 She crossed the road to move down into the brush. Then raced across the road again to go up the mountain. Learn to hide well. The hunters are already staking out the territory. This ride felt good. The temperature in Baldy was cool about 72F. Which helped keep the core temperature down and the water intake at a reasonable level. It was a fast ride for me to the Village 2:53:45. My goal is to drop another 20 minutes. I realize that I haven't heard from Hillbasher lately. 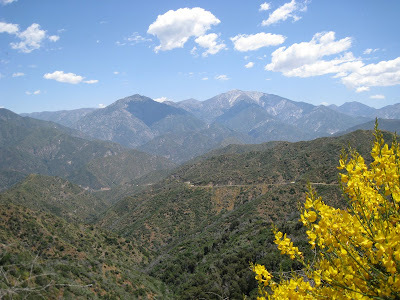 With only one way up on Glendora Mountain Road it amazes me we haven't crossed paths. Mr. Beanz and Hillbasher's February Slush Ride to the Baldy Village. I need to visualize this in the afternoons. Edge, Ray, Ron and Matt. How do I describe hot? 92-95F. Sun sizzling the sunscreen off your arms hot. Sun searing through black shorts, hot. More sweat than shirt, hot. Two water bottles hot. Fortunately this heat still had moisture in the air. Ron has cool footage of a rattlesnake. Waiting for his link. 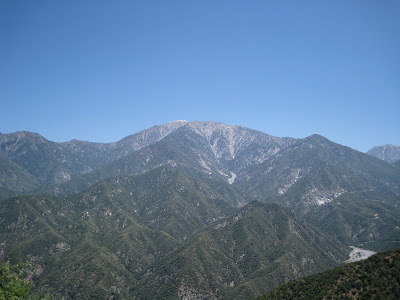 Check out this trip report up SR39 to Dawson Saddle. I have to ask when he started! I was chasing two of these guys up the hill. Really nice people. They were heading to Crystal Lake. 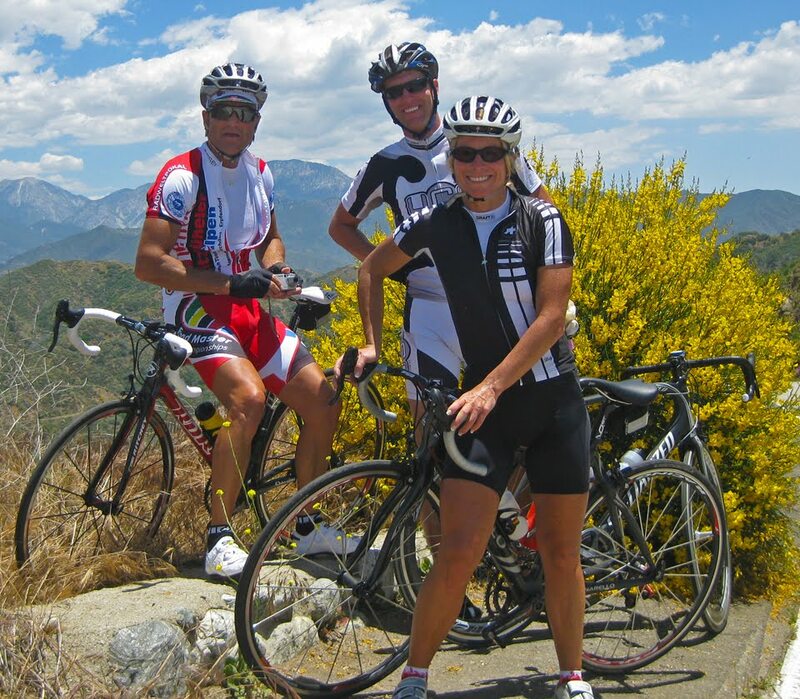 From L-R Egidio from Italy, Jason from San Diego, and Beth from France. I told them about the possibility of getting ticketed on Hwy 39 and Egidio said that he wasn't worried and would consider it a trophy for his visit to Calif! "We welcome tourism dollars in any form, Edigio!" Nice day for a ride. I did the loop from my house to Glendora and up GMR around to Baldy and back almost 43 miles. Did gate to ridge in 46:30 and gate to Cow Saddle in 1:44. Not bad times for a 61 year old, but I have done much better this year. Got stung by a bee or something on my tongue. Learned a good lesson. Keep my jersey zipped, my helmet liner in and mostly my Mouth Shut! Hope it doesn't swell too much. I react to bee stings. Take care, hope you had a good ride. 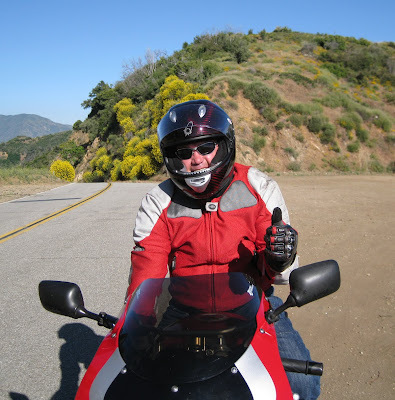 Thanks Ron, I had a great ride! Don't feed the wildlife! Saturday was grey and wet enough to register 0.01 inches of rain. That's what 91% humidity meant. The shorter cooler ride on Saturday left me "wanting" on Sunday morning. 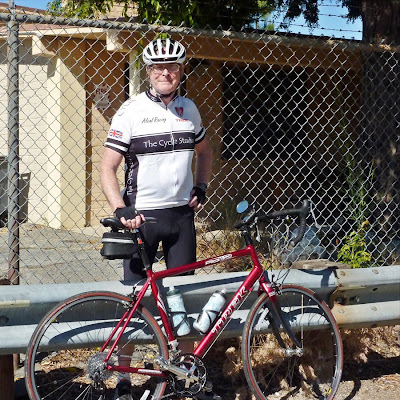 With a decision about West Fork nixed I rode out for a "recovery ride" up familiar territory. No stress of time or speed. No pushing the muscles. Look up and enjoy the world. 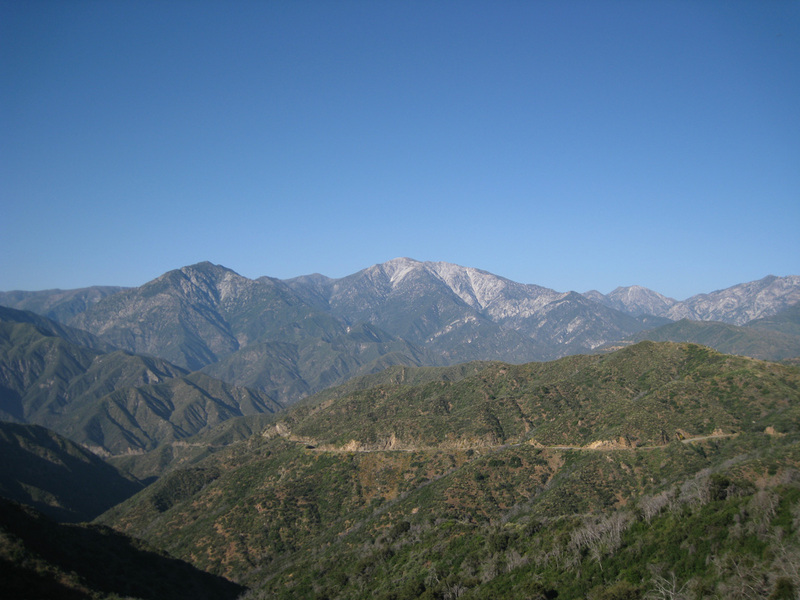 How different Glendora Mountain Road looked a day later. Caught up with Cathy of Bennett and Mike N. on his motorcycle. Glimpsed Frank of Whittier leading a fast descent with two other riders close on his tail. John C. caught me before Newman's Point. We rode to the shed and then around to the top of Monroe. We had six months or more of chatting to do. School and Physics 2A. Auto Repairs and insurance initiatives. Knee pain and positioning. At the top, it hit me. The warm bright sun, the blue sky and perfect cotton clouds. Above the city, on the road, meeting friends. This was what I needed. John and I descended. I spotted Ron along the way going up. He mentioned Italy. I needed to get home for a family gathering. Met Frank of GMR whose a good buddy of John. Frank sees it all go by. Great meeting you Frank! Temperature doesn't describe the whole weather conditions of the day. Even though is was 57F out, the darkness of June cloud cover hung over Glendora Mountain Road well above the 3000 foot level. 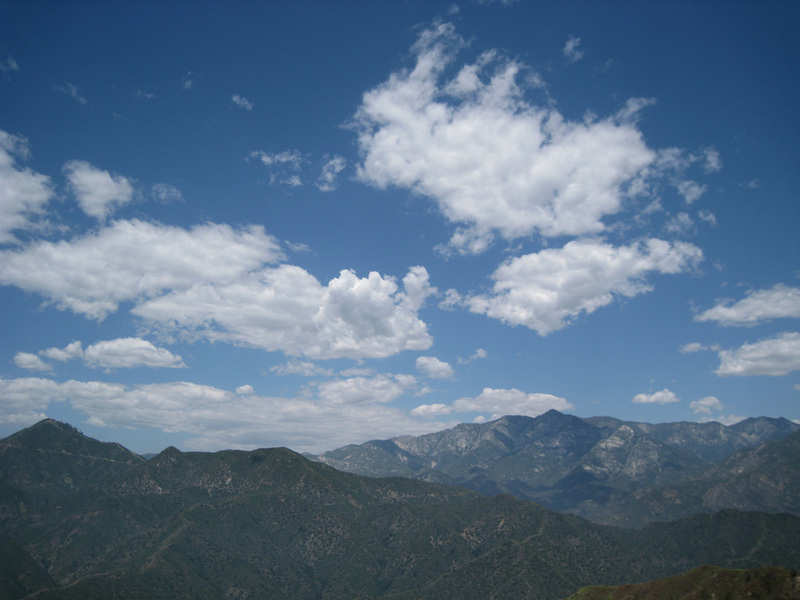 The damp gray wisps of cloud streaks danced on windy feet across the steep hillside. Thin veils of water like sheets hung on the air, then bounced off those that passed through it. I being the optimist wore more summer than winter attire. Tolerable going up, the exposed legs were quite cool on the way down. Toe numbing in short. The warmth of the yellow sun a fleeting memory, a trickery on the brain. The highs and lows of temperatures a starting point for describing a ride as warm, hot or cold. 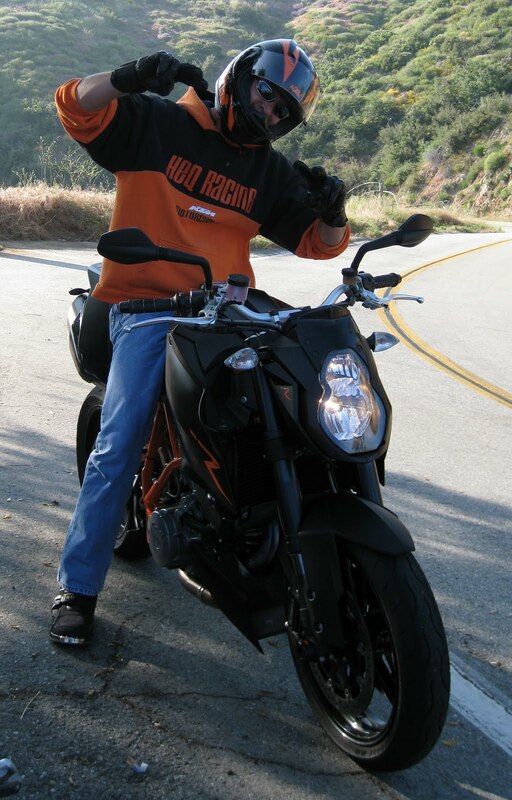 The gray did not dissuade those from riding either bikes, or motorcycles. There were plenty of folks on the road. I tagged on the back of those who passed for as long as possible. Equipped with enough water for a long ride, I stopped at Newman's and headed back down. The cold, the gray, new cleats on the shoes. Indicators to turn around. 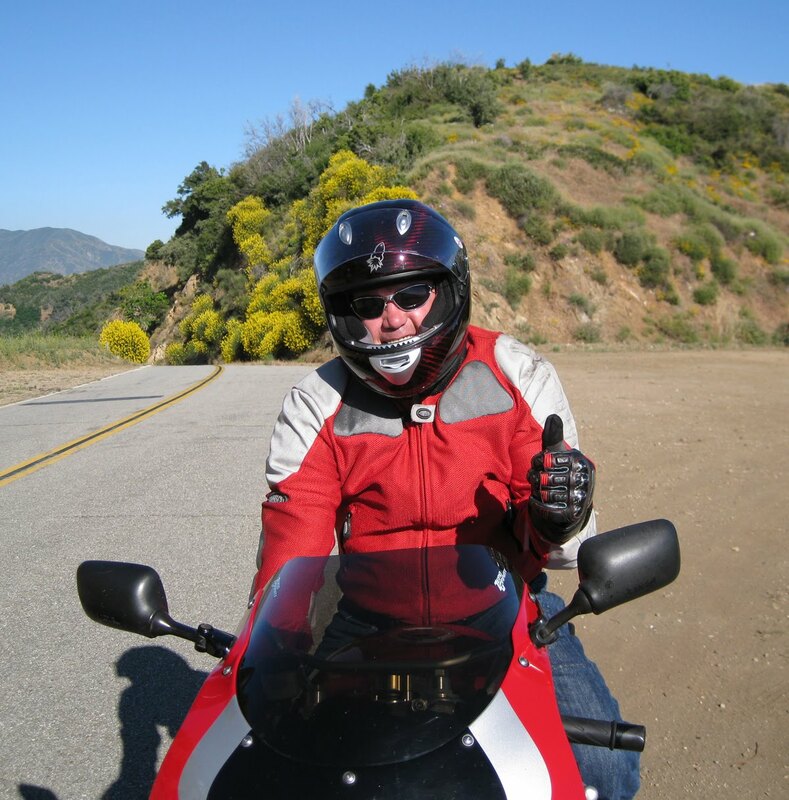 I managed to stay upright the entire trip. Bill started out fine until he flatted his rear tire two miles up the mountain. Race Extra Light tires held up for 2.1 trips on GMR. He opted to put on Armadillo tires. Good choice. 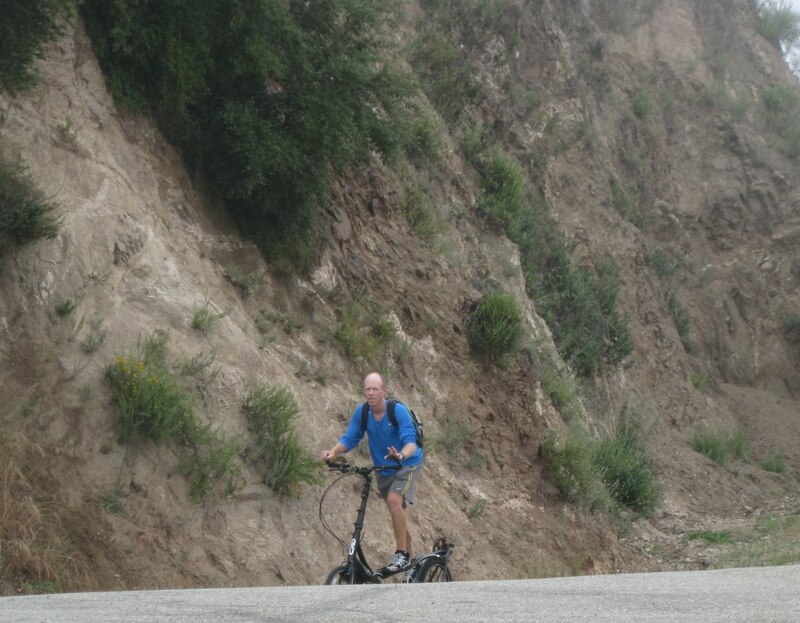 This fellow was on his way to Baldy Village on an ElliptiGo machine. No sore saddle area for him. Too many questions! Plenty more to watch! Short ride today. Tomorrow is the promise of sun and fun. Ride was quiet. No riders passed me going up the hill the entire distance along Glendora Mountain Road to the top of Monroe. I pushed for my time trial trying to duck during the windier stretches. Recorded my second best time of year at 30:00 even. There were cyclists coming down the hill. More than enough autos and motorcycles. With no one to inspire me, I rode a slower second half. Enjoyed the scenery. The water in the Little Dalton creek no longer burbled. The puddles slowly evaporating. 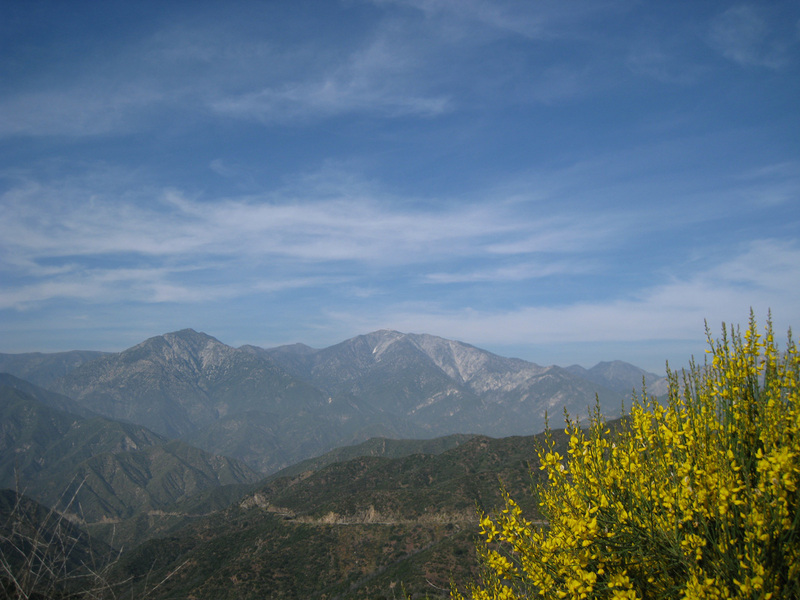 I stopped at odd places to take photos of the brilliant yellow spanish broom. 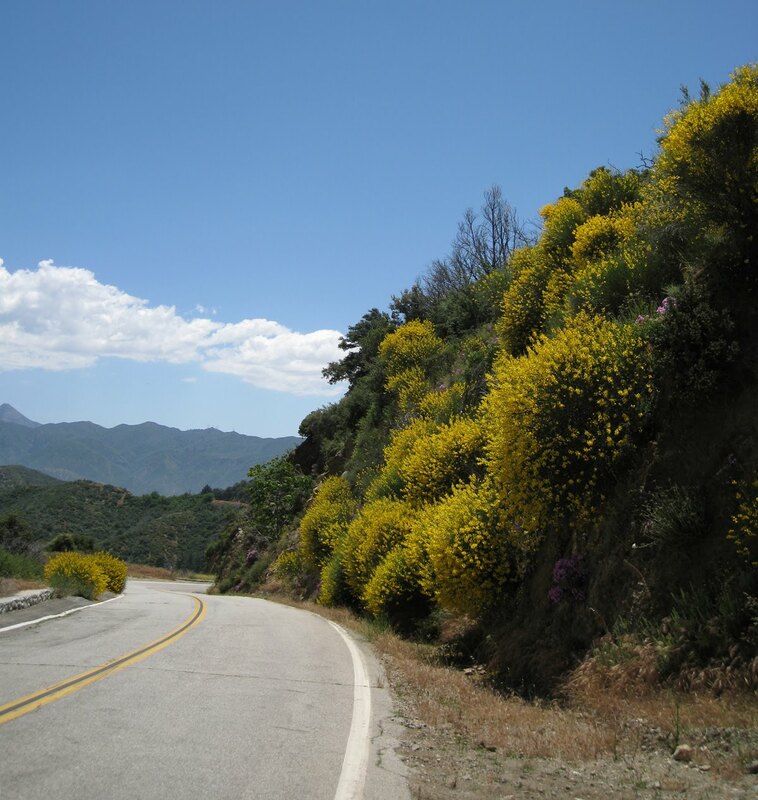 Check out the flora of Glendora Mountain Road and Glendora Ridge Road. Stunning pictures. On the way down, I tagged along behind Joan and Cathy from the First Saddle. We parted at Northridge and Live Oak. Hot today. 85F. Used a whole tray of ice cubes in two water bottles. I put in a good time trial time and a good time to Monroe. Kept ahead of the chasers to the top. and Matt at the shed. I took a slower descent. The jacket felt good on going down. The ride started early under thick morning coastal clouds with a predicted temperature in the 90s. Bill and I started out together, and separated at the electronic sign. Quickly gaining ground above the cloud cover at mile marker 11.39, the brightness of the sun brought a perfect day for a long ride. 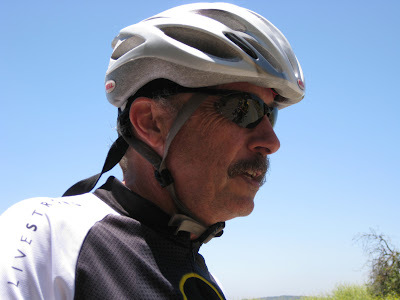 Bill captured the morning mood with his panorama at the first saddle. 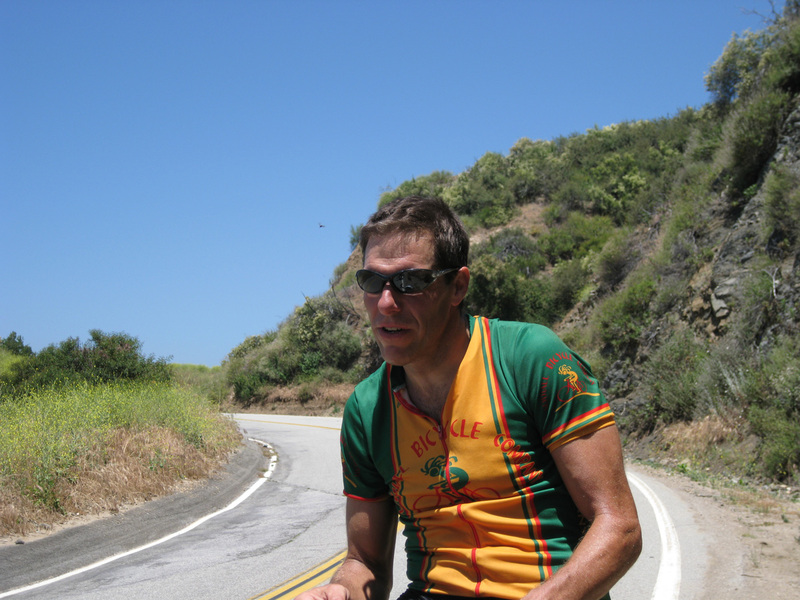 He reached the shed with stronger legs this week and ran into Matt on his way up the mountain. Back to my ride, a sheriff parked his vehicle in the dirt turnout by the shed. A bit unusual, but a welcome sight. Willie caught up with me as I took a moment at the shed. 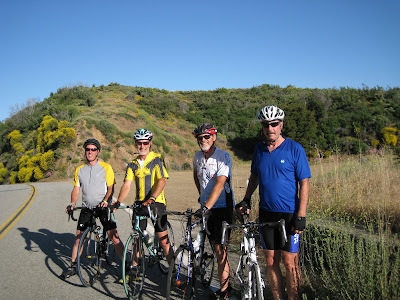 We rolled together on Glendora Ridge Road. 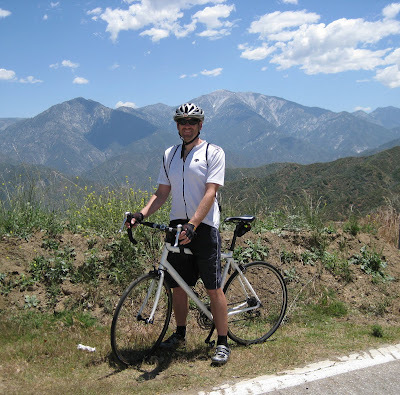 We chatted about last Saturday's adventures, Juan's two flat tires, prices of cycling gear and unpaved roads to East Fork. The heat of the sun bore down on us on GRR at mile marker 7. My cheeks grew hot, water doused on the jersey helped cool my core temperature. Tom a relative new comer prepped for the Ride around the Bear next week. Spotted the search and rescue helicopter flying away from Baldy Village down the valley towards Claremont as we descended from Cow Canyon Saddle. Willie the super domestique paced me to the Village in record time. The post office thermometer registered 80F. Hot for the village at 4000 feet elevation. The shade, water and a spot to sit in front of the post office was a welcome relief. Mandy and Francis of Adobovelo.com arrived from their first lap to the ski-lifts. Matt and Juan arrived and cooled their heels in the shade. Lots of decisions, go on, go back, go down. Juan and Tom opted to try the ski-lifts with Mandy and Francis. Willie was keen on getting back quickly. A Caltech group stopped for water on their way to their lifts. Their next adventure was SR39 to Dawson and then back highway 2 to La Canada/Pasadena. 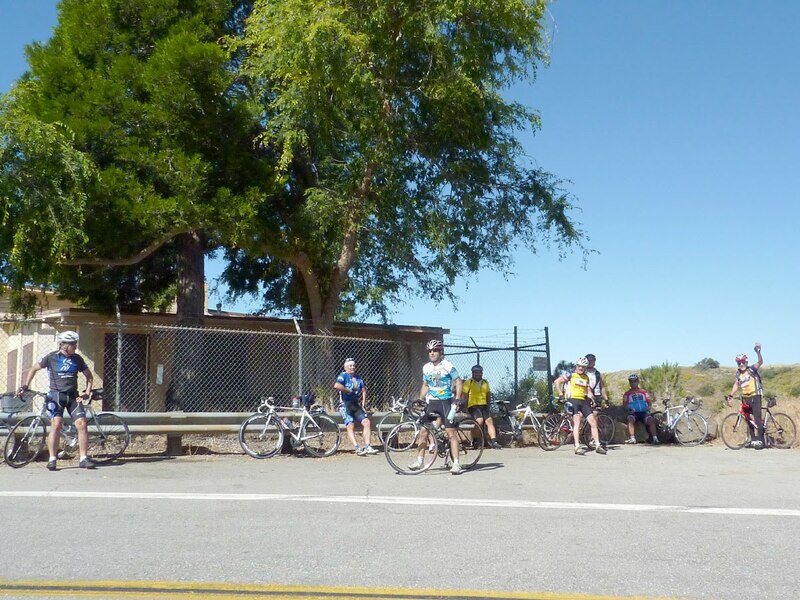 There are those who do the loop down Baldy Road to Baseline, Route 66 to Glendora. I prefer going back the same route. Matt and I rode back. Check out the images in Matt's glasses. A good day to be above the cloud cover that turned into a thick grey-brown layer over the metro area. It was cooler in the village. It was 95 when I arrived home. Hot, happy and hungry. A great day for a ride. Air temperature was in the 80s. 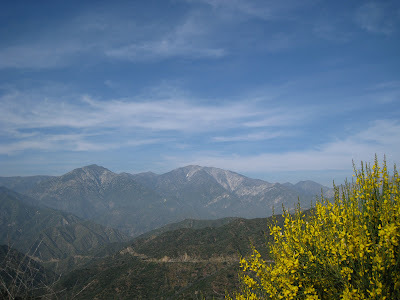 The layer of clouds and smog hung over the valley thick with color. I traveled light. Two water bottles. No need for a jacket. Easy warm up to the electronic sign. After a light night's sleep staying upright was the priority. I opted for a steadier speed tonight. Noticed the new oil spot and clay sand in the S-bends beyond mile marker 12.79. While the clay absorbs the oil, motorcycles can still slip on the grit. A shattered rear view mirror and other smashed parts lay on the dirt shoulder. Good ride for the time trial. The section beyond the first saddle was slower. I lured one rider into passing me, then I kicked it up a notch and enjoyed riding his back wheel for a mile along with his friend. Good to have external motivation. They stopped at mile marker 7. I pressed on to the top of Monroe. Cooling my heels at the shed, a rider with a Williams kit on a Cannondale Super Six bike stopped. I asked if he rode at the Pro-level. He chuckled. Matt rode up and introduced me to Dom one of the co-owners of Incycle. Dom had specked out Matt's replacement frame after his crash a year and half ago. Dom recommended an entire new bike whenever Matt was ready. Dale and Ella arrived. Dale on his new Pinerallo Dogma with an asymmetric frame caught everyone's eye. Of course the real reason to get out on the road was the view. Always good to see. The ride down was chillier than expected. My teeth chattered with joy. Hopefully I will have a deep peaceful sleep tonight.